The great news is that the Ambassador of Italy has met the Postmaster General of the United States drawing his attention to the Brumidi Society request to issue a Brumidi stamp. We most sincerely thank His Excellency Claudio Bisogniero for his outreach to the Postmaster General Patrick R. Donahoe. This is an extraordinary development for which we are, indeed, most grateful. But now we must all do our part to make sure that the stamp is issued. How do we support the Ambassador and make this happen? It is no easy task to have a commemorative stamp be issued. The Postal Service receives, on average, 40 thousand pieces of mail each year regarding proposals, but only 20 to 25 commemoratives are issued each year. In most cases it takes a multi-year effort to achieve a stamp issuance. But, in our case we don’t have that long. Because the Postal Service requires significant anniversaries to be commemorated only in multiples of 50 years, if we don’t get a stamp in 2015, marking the 150thanniversary of Brumidi’s completion of his masterpiece The Apotheosis of Washington, then we will have to wait to wait to 2030 for another anniversary – the 150thanniversary of Brumidi’s death. The initiative of the Brumidi Society began on Dec. 1, 2012 with a letter to the Citizens’ Stamp Advisory Committee. (See attached letter). A thousand postcards and more than 20 letters of support were sent to the Advisory Committee since then. (See below and attached list of supporters who wrote). Many thanks to the Conference members who wrote. But, after nearly 11 months, the Advisory Committee has still not made a recommendation for a Brumidi stamp. My hope would be that all leaders represented in the Conference of Presidents organization who have not already written, will write the Stamp Committee, ASAP. Attached and below is a model letter you may find useful if you wish to write such a letter. I, of course, encourage you to express your thoughts in your own words. Please use your organization’s letterhead for your letter. Your letter must be mailed via the U.S Postal Service, as the Stamp Advisory Committee does not accept e-mail letters. When you do write the letter, please be so kind as to e-mail me a copy of your letter to the Stamp Advisory Committee. Finally, I am sorry to report that the U.S. House of Representatives resolution to support a Brumidi stamp (H. Res. 101) is not doing well. After more than seven months since introduction it has only 13 cosponsors. 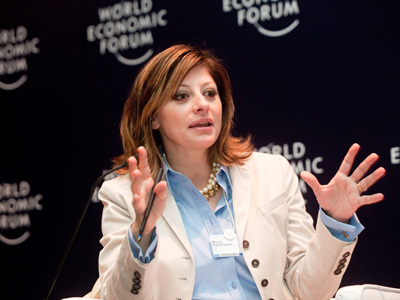 Only seven out of the 36 House members of the Italian American Congressional Delegation have co-sponsored. Please call the Capitol Switchboard at 202.225.3121 to reach your representative and ask her/him to become a cosponsor. (See below and attached, for a list of co-sponsors and a list of Italian American House members who have not, as of yet, cosponsored). Please do not hesitate to contact me at 202.364.2525 if you have any questions. I very much appreciate the support of the Conference for past Brumidi initiatives. Re: Honor Constantino Brumidi with a U.S. Postage Stamp. I respectfully request that a commemorative stamp be issued by the United States Postal Service for the Artist of the Capitol Constantino Brumidi in 2015 to mark the 150th anniversary of the completion of his most important work of art: The Apotheosis of Washington in the U.S. Capitol. 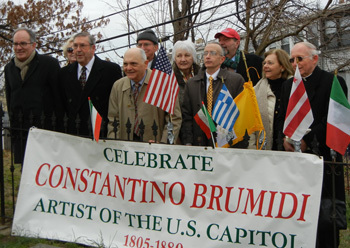 In 2008, Congress passed, and President George W. Bush signed, legislation awarding Constantino Brumidi its highest civilian honor, the Congressional Gold Medal. This most prestigious medal is given out by Congress “as its highest expression of national appreciation for distinguished achievements and contributions.” (U.S. House of Representatives Website: Gold Medal Recipients). Presentation of this most celebrated medal, awarded by Congress only 144 times in 224 years, is in itself, justification for a stamp. But there is more that should be considered. Brumidi began painting in the Capitol on February 19, 1855, and spent 25 years of his life painting, decorating and beautifying its corridors, committee rooms, and most notably the Rotunda of the Capitol, our Nation’s most important ceremonial space. He created many magnificent paintings and decorations depicting the history, inventions, values and ideals of the United States, thus enhancing the dignity and beauty of the Capitol. In 1865, he painted his masterpiece, The Apotheosis of Washington on the 4,664-square-foot canopy over the eye of the dome, 180 feet above the floor of the Rotunda. Brumidi’s crowning achievement is the focal point of the Rotunda, which is now seen by more than two million visitors each year. Also, frequently reproduced in books and newspapers and seen on TV, The Apotheosis of Washington has become an American icon. Brumidi, born in Rome, Italy in 1805, trained as a fresco painter there; he worked in the palaces and churches of Rome. He immigrated to America in 1852 in search of liberty and fulfillment as a painter; he became a citizen in 1857. His life is the embodiment of the immigrant’s dream. . He died on February 19, 1880, exactly 25 years after he first began work in the Capitol. On his burial marker authorized by Congress it states: “My one ambition and my daily prayer is that I may live long enough to make beautiful the Capitol of the one country on earth in which there is liberty.” In this endeavor he magnificently succeeded! A stamp issued by the U.S. Postal Service is a wonderful way to educate Americans on little-known individuals who have made a huge contribution to the Nation. Constantino Brumidi is just such a person. Please give serious consideration to this worthy cause. Thank you. UNITED STATES CAPITOL HISTORICAL SOCIETY, Ronald A.
Sarasin, President, Former Member of Congress (CT-1973-79) – Jan.
ARTURO TOSCANINI LODGE #2107 (OSIA) (Commack, NY), Stanley B.